A few weeks ago, I shared some tips on using the Southwest Rapid Rewards card to fly free. Check out that post here. Flights are a huge expense, but if you can get a free place to stay, it can be an incredible help on the ole wallet. 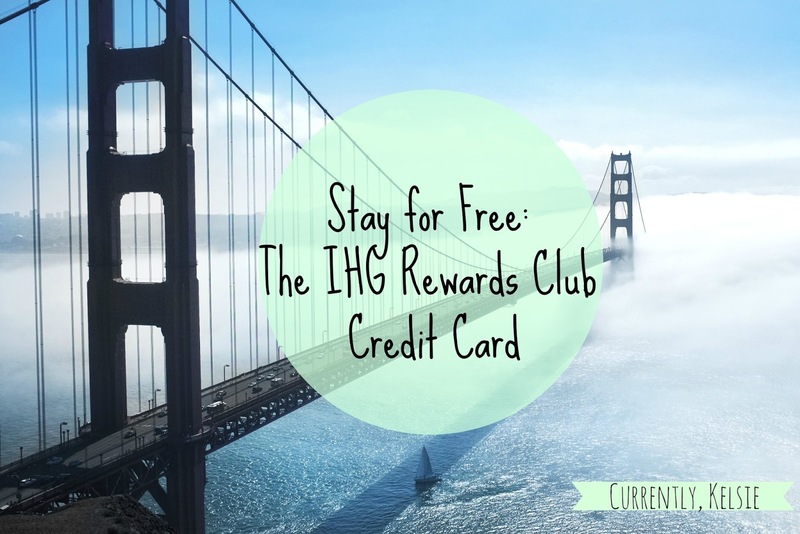 So here's the second installment of travel tips on Currently Kelsie, this time telling you how to get free hotel stays using the Intercontinental Hotel Group (IHG) Rewards Club Credit Card. The Intercontinental Hotel Group, otherwise referred to as IHG, consists of several hotel brands including Holiday Inn, Holiday Inn Express, Intercontinental, Hotel Indigo, Staybridge Suites, and Candlewood Suites. Their rewards program is free to join, and offers points for hotel stays. You can also earn points by doing the dining or cruising rewards programs, but the best way to get them in a hurry is with the credit card. At the time of this post, IHG is offering 70,000 points when you signed up for the credit card, but when we got the card, we got 80,000 points. Sign up when bonuses are highest in order to maximize your free stays. You apply for the card. Once you receive it, you have to spend $1,000 within the first three months of opening the account. Then the 70,000 points are yours! It's pretty easy to reach this within a month, just by buying groceries, filling up the gas tank, and paying bills. You can always purchase pre-paid gift cards as needed. 70,000 bonus points can usually get you at least 10 hotel room stays, as long as you are decisive about which hotels you use for points. Point Break hotels are the real way to go (more on that later). Automatic 10% point rebate. You use them, you get them back. It's a beautiful thing. Platinum Elite Status, which gets you priority check in and room upgrades. No Foreign Transaction Fees. Super nice if you're going out of the country. $0 Introductory Annual Fee. Only $49 the next year, which is nothing since you get your free night anywhere in the world. A no brainer. Earn DOUBLE Points on gas, groceries, and at restaurants. Really adds up! Roll-Over Nights. If you don't use them, you don't lose them. And dates are never blacked out. 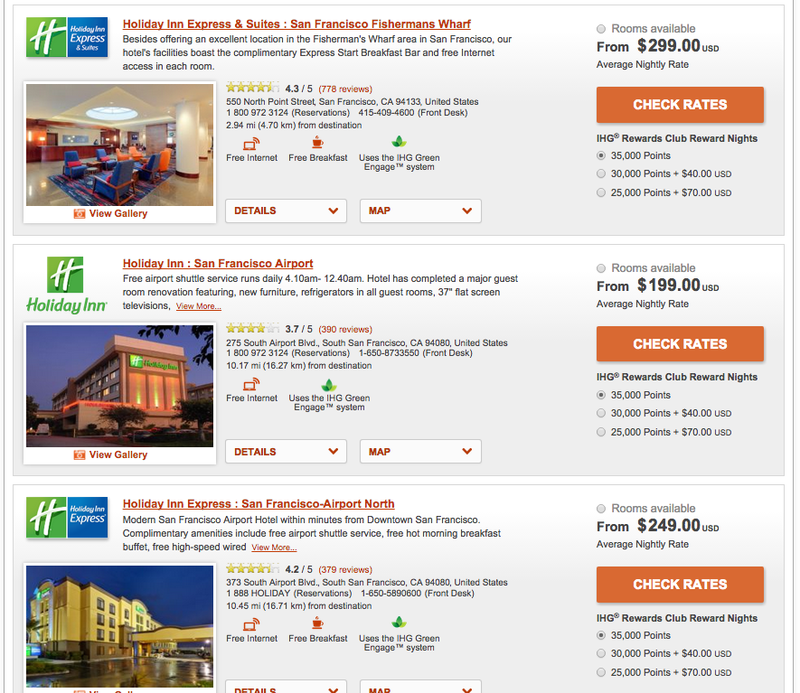 Notice how it allows you to book nights with points, or with a combo of points and dollars. This can help if you have some points, but not enough, or if you want to break up the use of your points. San Fran is pricey for points. Using the Map View is super helpful. 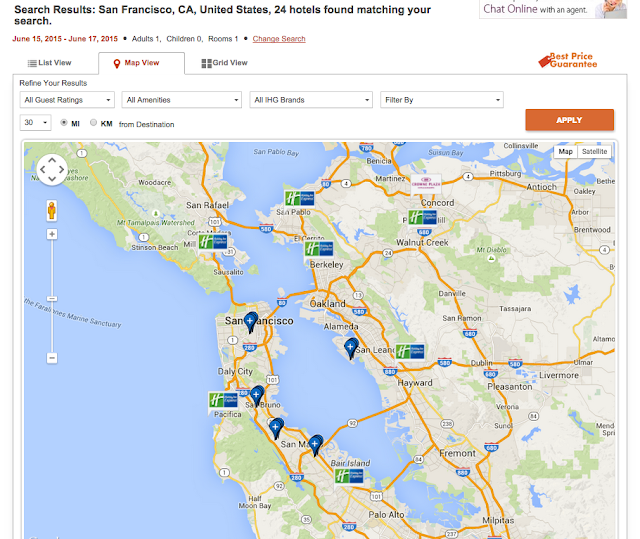 You can see all of the different IHG locations in the area. This is an example using San Francisco, CA. The map view is perfect for planning road trips! Also, San Francisco isn't the best place to use points....it's pretty expensive. Point Break Hotels are one of the BEST things about this card. 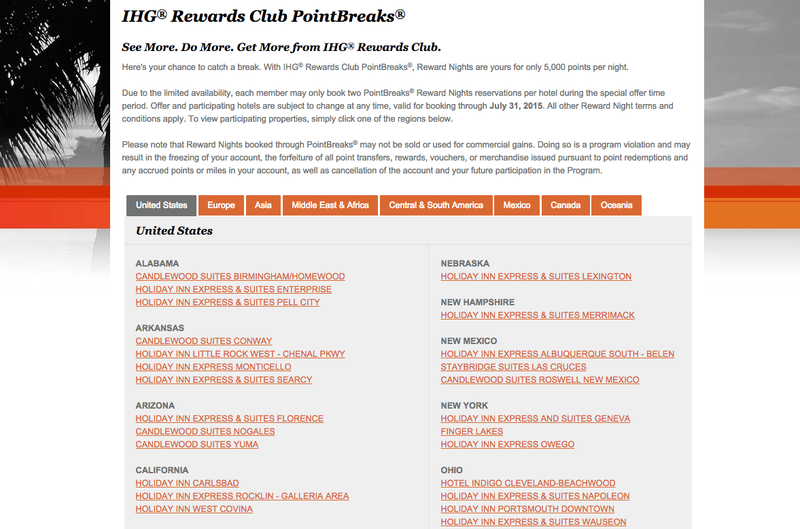 Every few months, IHG releases a list of hotels across the world (with most in the US) that you can get for only 5,000 points. This is HUGE because it means that you could get up to 14 free nights just on your card bonus alone (and remember, you're going to earn points for all of your spending too!). It's best to be flexible in order to really use these. Think about various places you would like to go that are within driving distance. You can only book two nights per each specific Point Break hotel for that round of released options, but you could book as many total as you wanted. 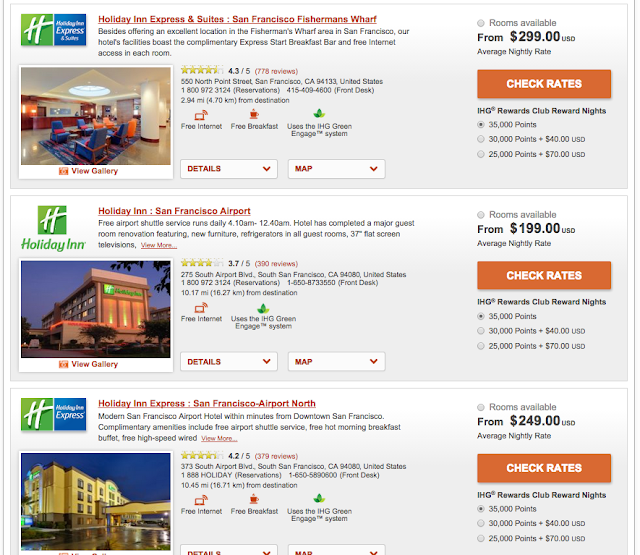 This is a selection of the Spring Point Break hotels, available to book through July 2015. You'll have to have your points earned in time to book fast when they come available. Being flexible on your travel location is huge. Aaron and I have stayed ten nights for free so far on this card, and we still have points to use! We used three free Point Break nights for our Southwest Spring Break trip. For Spring Break 2014, we used seven free nights as we drove across the Southeast. You can really maximize this card when you have a car (either rental or your own). This way you can stay at Point Break hotels or other cheap point hotels across the nation, stopping to sleep for free before you head to your next destination. Staying out in the suburbs is always worth less points than staying in the city, but it's so worth it. Honestly, we don't even bother booking reward nights unless they are 10,000 points or less. You really want to get the most bang for your buck (or free points in this case). Ready to Get Started? To apply for the card, check out this link. Still have questions? I would love to tell you about our experiences or answer any questions you may have. Click here to contact me, or comment below. If you'd really like to dive deeper into making IHG work for you, check out this awesome guide: http://travelisfree.com/2014/07/29/the-complete-guide-to-ihg-rewards/. If you liked this post, and want to be updated when new travel tips or posts are shared, click here to sign up for our newsletter. Happy Travels! Wow, you've definitely made this credit card work for you! So many places--and so many bills!--don't even take credit cards where we live that it's hard to justify having any more than just one, but I love to hear about people using credit cards wisely and strategically! Hey thanks, Rachel! We love making our money work for us! I know credit cards can be a huge debt problem for some, but they've been an amazing help for us. Thanks for the tips! Happy traveling!! !